MesaTech has launched a Kickstarter campaign to build tiny, deployable models of NASA's huge James Webb Space Telescope to show the public how the ambitious observatory will unfold in space. As NASA gears up for the launch of its next great space telescope in 2018, a model-making team is asking for help to create miniature versions of the huge observatory for public outreach. 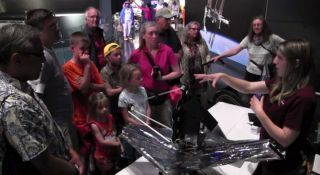 The group, MesaTech, which describes itself as a "broadly purposed cooperative founded and managed by our members," launched a Kickstarter campaign asking for $25,000 to produce models of NASA's infrared James Webb Space Telescope (JWST). As of today (Aug. 4), the campaign has raised more than $8,800, with three weeks until its deadline on Aug. 21. The one-twentieth model, the largest of the set, would be about 3.3 feet (1 meter) long. The actual telescope will be about 70 feet by 47 feet (21 m by 14 m), including its sun shield. "We'd like your support, at any level, so we can produce many more of our deployable models and spread hands-on learning and increased understanding of JWST worldwide," MesaTech representatives wrote of the campaign. "We developed and refined many prototypes of our small robotically controlled deployable models of JWST. We've used those models at dozens of public events held across the country, to engage students, educators and the public in how NASA and [the European Space Agency] intend to get JWST out of the world's largest launch vehicle and unfold it into the size of a mansion to conduct its science mission." NASA's JWST aims to study features across the universe's history, ranging from when galaxies were first created, to how stars and planets are born, to (possibly) the ingredients for life. JWST has been billed as a successor to the Hubble Space Telescope. That observatory launched 25 years ago and is still working well, after five space-shuttle-servicing missions, the latest of which was in 2009. MesaTech's model was developed using information in the public domain that was then refined after public showcases, the group wrote. Components were manufactured using 3D printers, computer-controlled millers and other equipment. The group says it is experienced "in developing and operating scientific spacecraft and human exploration space systems, including JWST, Hubble and [the International] Space Station."